Digital India: Dream or Reality? Following the post-demonetisation release of cash money back into the Indian economy, economists Nithin M., Jijin P. and Baiju P. investigate the take up of digital banking and whether the government’s drive towards a digitalised India is really succeeding. India experienced its third episode of demonetisation in November 2016, when high valued denomination notes of Rs 500 and Rs 1000 were withdrawn at a single stroke which extinguished about 86% of the total currency value in circulation. Though the act of demonetisation was not unprecedented in its own history, the way it was executed took many by surprise and drew widespread criticisms both from academia and public. Demonetisation which aimed to curb black money, terror funding and counterfeiting was later projected as the government’s push for digitalisation. Even when economic indicators like GDP, private investment and industrial growth plummeted, it was the growth in digital transactions that came to the government’s aid. Ever since then, the earlier objectives have taken a backseat and pushing India towards a cashless economy seems to be the prime objective. The publications of government and RBI (examined below) that use absolute figures seems to vindicate such arguments. It is quite true that there has been a tremendous rise in the value of digital transactions in the current fiscal year (2016-17) compared to last fiscal year (2015-16). There has also been astounding growth in digital transactions viz. mobile wallet, mobile banking and IMPS (immediate payment service). While the IMPS transactions grew by 153% in the current fiscal, mobile transactions (mobile wallet and mobile banking together) grew by 221%. In addition to this, POS (point of sale transactions) grew by 65% while the value of ATM transactions declined by 7%. The above figures can be attributed to the restrictions imposed on cash transactions and after effects of demonetisation. The growth in digital transactions in the immediate months following demonetisation has been phenomenal. This is reflected in quarterly statements also. Baseless claims of demonetisation pushing digitalisation based on the above figures are absurd and do not present the true picture. RBI and Government seem to miss this very point in these claims. The value of IMPS transactions that was worth 268.5 billion rupees in August 2016 rose to 651.5. But this growth is more sequential than something extraordinary as IMPS transactions have been on a rising trend. POS transactions that were worth 587.34 billion rupees in the month of demonetisation rose to a record high 891.80 billion rupees. This, however, declined to 717 billion rupees in August 2017. Similarly, mobile transactions that were worth 1069.71 billion rupees in August 2016 rose to 1398.76 billion in November 2016 and to a record high 2206.14 billion in May 2017. But again, like POS, mobile transactions too declined to 871 billion rupees by August 2017. On the other hand, ATM transactions worth 2550.81 billion rupees in October 2016 nose-dived to 1235.91 in November and 850.22 in December 2016. The restrictions imposed due to demonetisation rendered people helpless to use their own hard earned money deposited with the banks. It took some time before sufficient cash found its way back to the system and not just the expected ’50 days’ as the prime minister promised. The growth in ATM transactions and fall in digital transactions once there was enough cash suffices the people’s preference for cash. The baseless claim of demonetisation pushing towards a digital economy is very much in contention. Figure 2 shows the trend in usage of payment instruments in the share of total transaction value. 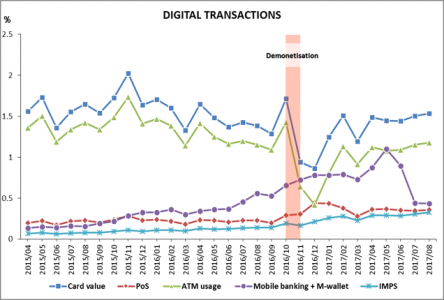 Though the decline in the share of ATM in total transaction value in the immediate months following demonetisation seems to support digitalisation, the rise in ATM transaction afterwards challenges digitalisation. POS transactions also have declined to its historic levels after an initial surge following demonetisation. This suggests the preference for cash transactions over digital transactions in the economy. Other important digital payment means like mobile banking, mobile wallets and IMPS also showed similar results. A spike in growth of the share of mobile banking in May can be attributed to a preference for new apps and technology than digitalisation. The decline in the following months further vindicates this preference of the people. To further examine whether the impact of demonetisation on the variables is of permanent (Step Function) or transient (Pulse Function) nature, the econometric technique of Intervention time series analysis was also employed. The results of the analysis show that the growth in mobile transactions and POS transactions and the decline in ATM transactions are transitory while the growth in IMPS transactions is permanent. It should be noted however that IMPS transactions constitute only a negligible share in total transactions. All the above results further point against digitalisation. In short, it was the cash crunch due to demonetisation that pushed people towards digital transactions. It continued till sufficient cash found its way back to the system. As cash got replenished in the system, people shifted back to currency for their transaction causing a fall in the share of digital transactions in the total transactions. This essentially underpins that the ‘dream’ of the digital economy is not quite plausible with the infrastructure impediments and habit persistence of the people. For this to be plausible, we need more policies and projects that seek to bridge out this gap. The economy should traverse rather than being pushed to the digital economy which otherwise will have disastrous effects. The question that still remains is if demonetisation did not achieve digitalisation either, then what else did it? You can read also read more of our articles on demonetisation here. Nithin M. is a final year Mphil Economics student at the University of Hyderabad. His research interests include issues relating to monetary economics with special emphasis on Central banks including inflation; transmission of monetary policy; NPA problems of banks; and applied econometrics with reference to time series econometrics. Jijin P. is a final year Mphil Economics student at the University of Hyderabad. His primary research interests focus on determinants and the developmental impact of remittances, exchange rate determination, and crisis migration. November 28th, 2017|Economy, Featured|Comments Off on Digital India: Dream or Reality?